Candles are a common item around the modern home. We use them for emergency lighting during a power cut. Or we light them to alter the mood during a romantic dinner or a pampering bath. They’re also synonymous with magic – think of wishing on your birthday cake or lighting candles for a spell! Today we’re going to explore what superstitions feature these ancient household items. We’ll also look at the use of candles in magic. You can listen to the audio version of this post below, or keep reading! 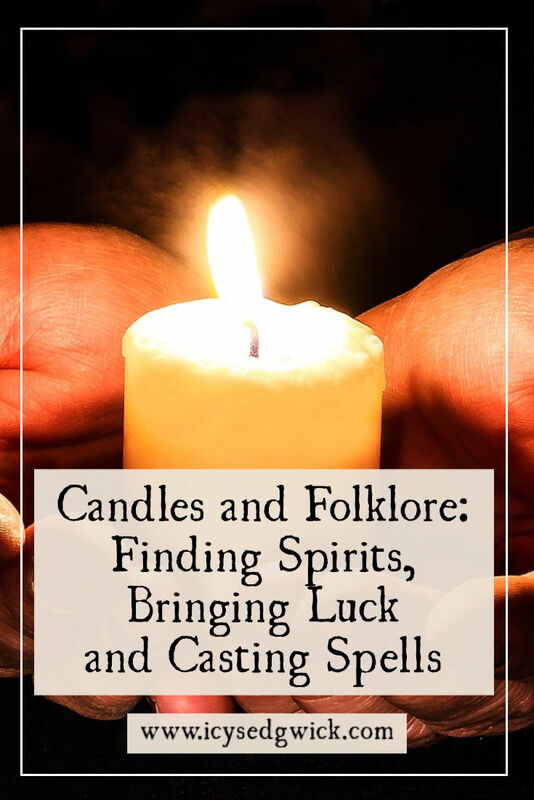 Bear in mind that candles are a huge topic, so in the interests of space, I’m focusing on just a small selection of superstitions and beliefs. Banish the idea of an old crone lighting candles to cast spells in a dingy hovel. In earlier centuries, candles would be beyond the reach of most households. 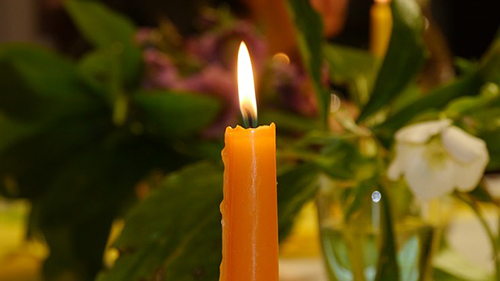 You’d likely only find beeswax candles in churches who could afford them. ‘Ordinary’ people would use rushlights or tallow candles. The latter was made from animal fat so you can imagine the smell as they burned. But that’s not to say candles don’t appear in magic! Happy birthday to you, happy birthday to yoooooou! 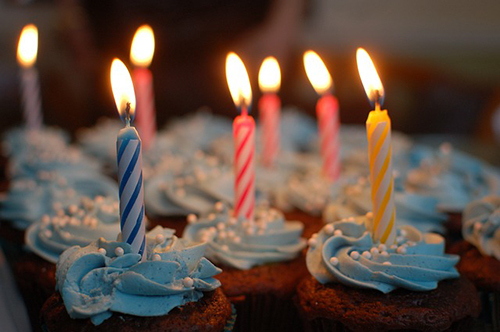 The number of candles on the cake varies; some traditions use the same number of candles as the age reached, others spell out the number using candles, and others use candles to denote groups of years (such as one candle for every five years). They’re not just there for their aesthetic value, either. Jan Harold Brunvand points out that the typical ‘belief’ that the wish will only come true if all of the candles extinguish in a single puff (2006: 170). The burning of candles in some spiritual faiths such as Wicca or witchcraft depends on the candle being ‘charged’ with a desire or wish. The burning of the candle then releases the wish or desire into the universe. The candle is a colour appropriate to the desire (so pink for love, or blue for healing for example), and may be inscribed with runes or symbols to help the wish on its way. Orange would be good for success in business, or to attract energy. 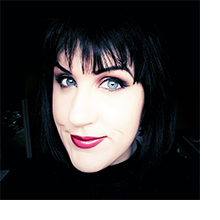 Find simple candle spells in The Magpie & The Wardrobe: A Curiosity of Folklore, Magic and Spells, which I reviewed here. Candles are a common sight in many churches too. According to this site, the origins of burning candles in Catholic churches may date back to the days of the Old Testament. Nowadays burning a candle represents Christ, the “Light of the world” (John 8:12). Alternatively, lighting a votive candle represents a prayer being offered. Lighting candles also features in Diwali, the Indian festival of light celebrated by Hindus, Sikhs, Jains and Buddhists, as well as other religious festivals. An exchange in the correspondence section of the Folklore journal reveals an interesting custom involving Christmas candles. E. C. Blanchard wrote to the journal asking for information about “the custom of burning two candles on Christmas Eve” (1917: 106). The response explained that the custom was common in Cumberland, Lincolnshire, Yorkshire and “probably” Northumberland, and involved only one candle. The Christmas candle was around “half a yard in length”, and “usually a gift from the grocer to his customers” (1917: 107). The family lit it during supper on Christmas Eve when everyone had made it to the table. Lighting it too soon, or snuffing it out before the end of supper, brought bad luck. The family kept a piece of the candle until the following year. The same article also explained a similar custom in Cornwall, where a member of the family painted designs on the candles. Colliers carried lit candles on a board near Oswestry as a way to ask for money. Perhaps the most obvious reason to burn a candle is to keep the darkness away. If you hold the shadows back, you may also repel the sinister creatures lurking in them! For some, placing a lit candle inside a jack o’lantern at Halloween holds evil spirits at bay. The burning candle acts as a protection device for your home. Yet the Celts originally believed that a light by the door would guide lost spirits home. But fire in many forms was often used to protect a home, or a community. Lighting beacons was a way to call for aid. This was especially true in the Borders. If a castle or twoer came under attack from reivers, lighting beacons signalled to allies for help. A candle is the smallest and most portable means of having fire (relatively safely) in your house. 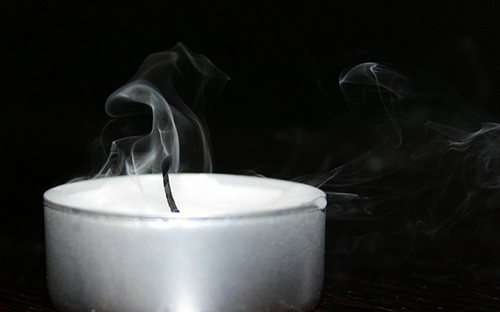 Some believe that if the candle suddenly blows out, it means evil spirits are near. I suppose they’re a supernatural Davy lamp, of sorts. I’ve also heard that if the flame burns blue, it means a ghost is present. One superstition claims that looking into a mirror by candlelight revealed the ghosts in your home. Candlelight illuminates your home, as well as the shadow realm you can only see through a mirror. If candles burn out entirely, robbers will come to your home. Though that’s possibly because it’s easier to commit crimes in the dark. It could also refer to the candles ‘created’ for the Hand of Glory. Candles flicker and flare according to air patterns in your house. But if the flame suddenly jumps, then a neighbour has gossip to pass on. Ooh someone must have something juicy to pass on! 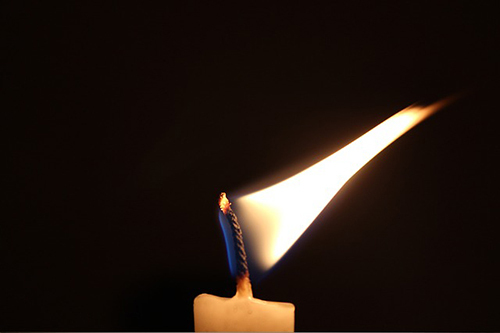 If a bright spark shoots up from a nearby candle, you will receive a letter soon. Some believe a candle should never be extinguished without the sign of the cross being made. I’ve also heard of Wiccans who won’t blow out a candle for fear of offending the fire elemental in the flame. They’ll only pinch or snuff out the candle. A candle that burns until it goes out brings only bad luck. That superstition makes sense. In earlier centuries, candles gave the only source of light. Letting a candle burn out was a quick way to essentially throw your money away. Candles were a bad thing indeed for sick people too. Carrying a lit candle into a sick room would also herald the death of the invalid. Even keeping the candle out of the room was no guarantee of safety. If the smoke turned towards the church, it meant the invalid would die soon (Daniels & Stevans 2003: 421). Candles have a multitude of uses, from protection of the home, to sending wishes into the universe. If Neil Gaiman’s Stardust is to be believed, then candlelight is also the fastest way to travel! Over to you! What superstitions do you follow around candles? Blanchard, E.C. (1971), ‘Christmas Candles’, Folklore 28 (1), pp. 106-107. Brunvand, Jan Harold (2006), American Folklore: An Encyclopedia, New York: Garland. Daniels, Cora Linn and C. M. Stevans (eds) (2003 ), Encyclopedia of Superstitions, Folklore, and the Occult Sciences of the World, Honolulu: University Press of the Pacific. Love this. I adore candles, I did a lot of reading on magic and spells etc as a teen and learnt all about colour candle magic just done some more research for a story so this is quite timely 😀 thanks my lovely. I regularly practice ritual candle magick. One of my favorites is to anoint a green candle with prosperity or money draw oil. Then I sprinkle a shredded dollar bill on it, Then I sprinkle finely shredded printer’s gold on it. Next I prepare my alter and light the candle. If it burns slowly, it means that whatever financial thing I asked the gods will slowly come to pass, if it all. If it burns quickly, it means I’ll have little resistance to my financial request and it will come to pass soon. Great post Icy! Do you find that it works? Yes. That is one of the most effective candle rituals I have. I have seen a candle that’s supposed to last hours get consumed in minutes. A few days later, I received a very generous raise and a promotion. On the other hand, I have seen identical candles burn all night and not get what I want. The faster the burn the more likely it is that I’ll get what I want. A candle superstition I read was that if you light mulberry candles between Christmas & New Year’s, it’ll grant you a wish. I plan to try it out next month, so wish me luck! Oh do let me know if that works!